The short answer is YES! It is safe, and in fact, recommended. But, how do we start and maintain a routine? By far the best answer is to find things you love to do. It is much more important to do something than to do nothing. One question often asked is should I drink the protein shake recommended at my gym? No, you should not take the protein shake recommended by your gym without consulting your dietitian first (there may rare cases where a dietitian recommends a protein powder to someone with PKU). These protein powders are not made for people with PKU and they contain high amounts of phe. It’s also a good idea to check in with your dietitian if you are thinking about adding any other type of supplement (such as amino acids or creatine). Check out this handout by Karen Dolins, EdD, RDN, CSSD and Taryn Bosdet, RD for much more in-depth information regarding common questions about exercise and PKU. This guide discusses the how, when, and what of maximizing protein and carbs for training as well as information on the timing of taking protein and carbs to help maximize the benefits of training. This guide differentiates the benefits of different types of excercise, and may help you choose what you want to focus on. 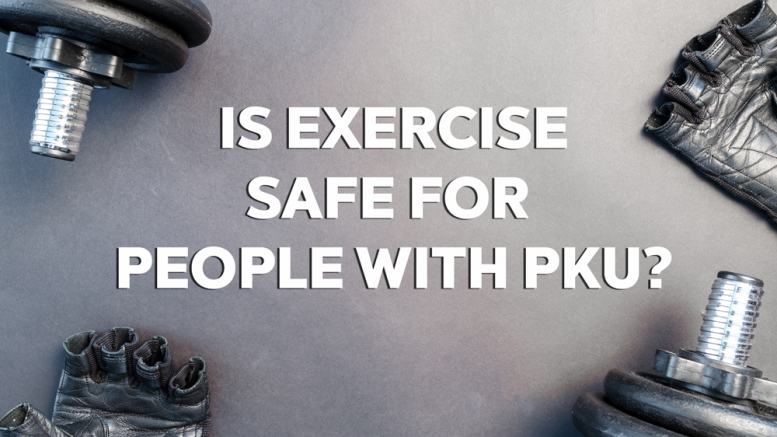 First, it is very common for patients and parents to ask about exercise in PKU during clinic visits and it was a question submitted at Ask the Dietitian. Second, we agree that there are formulas that have suboptimal amounts of sugar (see this months article regarding dental caries in PKU). However, what we do know from both the exercise and PKU research is that adequate amounts of protein are needed in the recovery phase. This is especially true for those who are seeking to build muscle (body builders) or are training for longer endurance sport or competition. For those with PKU this is best accomplished with PHE-free formulas. For now, that means getting PHE-free protein along with the sugar. Regarding timing of carbohydrate intake, that very much depends on the length and exertion of the exercise. For instance, running a marathon will require differing amounts, types, and timing of carbs than will a 1-2 mile run. There is not much need, nor any recommendation that in short term (<1 hour or so) exercise one should consume any food and thus can activate beta-oxidation for burning fat stores. Thanks for these great questions and comments. ASK THE DIETITIAN is a feature of PKU News. It is not a substitute for medical advice, but a place to ask questions that might be useful to the entire community. Do you have a question? Ask it here.